Sonos makes some of our favorite wireless music products of all time. The problem has always been the price of entry—and that's where Play:1 comes in. 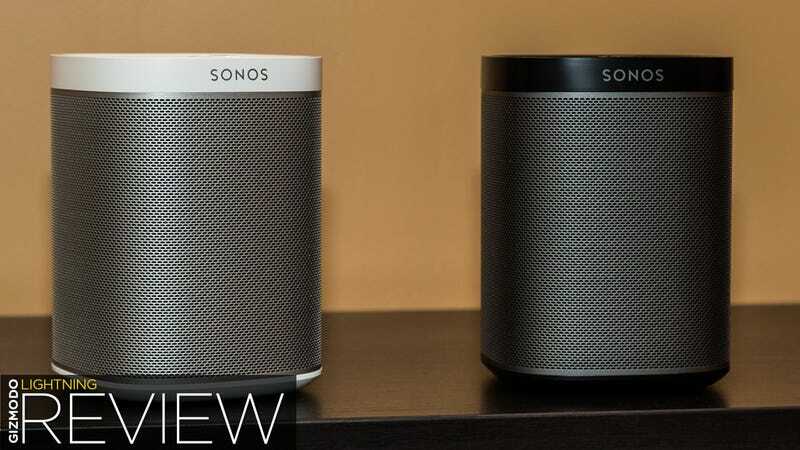 Meet your entry-level Sonos. A $200 powered two-way speaker with a built-in Wi-Fi connectivity. Sonos is the long-time leader in wireless music because it makes systems that just work. By taking full control of how the system works, from the app you use for playback all the way to the hardware, Sonos has turned wireless into something that everybody can enjoy. Now, however, it's got real competition from vastly improved Bluetooth systems on the low-end as well as from new end-to-end Wi-Fi options from both Bose and Samsung. People who want to buy into the features of the Sonos ecosystem at a lower price point. People who are tired of the reliability and range limitations of Bluetooth. A handsome, grate-covered box that makes the similarly priced plastic bluetooth speakers out there seem like cheap garbage. Three button volume and playback controls on the top. The overall footprint is about the size of a frosty beer mug or a full bag of goldfish. The Play:1 is designed so that it can work as a standalone wireless speaker by connecting it the included ethernet cable directly into your router. But in all likelihood, you're going to want to set this system up with a Sonos Bridge that connects to your router so that you can go put the Play wherever you want within Wi-Fi range. This'll also allow you to set up multiple Sonos systems throughout your house. Play:1 is designed as a standalone, and on its own, a single unit is powerful enough to fill up a decent-sized living room. If, however, you're going to use this as your main music system in a room larger than a closet, you're going to want to pair it with another for a stereo setup. That said, the sound quality of a single unit is really impressive, even without left-right panning. The sound makes anything else at a $200 price-point sound pretty pathetic. Technically, the larger driver inside Play:1 is only a mid-range, but I was quite impressed at how much low-end something this size can throw out. Overall, the sound is spectacular. Easy-to-use and beautiful-sounding like a Sonos, priced like a Bluetooth speaker. That Sonos still doesn't have an entirely battery-powered unit you can pick up and easily transport from place to place. Play:1 makes it pretty clear that Sonos doesn't want to put batteries in its systems. There's a practical reason for this in that powering the Play:1's thundering bass would be tough in a standalone system with any kind of battery-life, but still, boo. The traditional "mute" button on all Sonos products has been replaced by a "play/pause" button that allows you to simply walk up to Play:1 and start on whatever you were last listening to. This is an important change because it reflects something the industry is learning about how people want to listen to music. Even if Sonos' desktop and mobile controller apps make for relatively seamless wireless listening, a lot of people miss the boom box experience of yore where all you had to do is walk up and switch it on. Bose's new Sonos-like system offers exactly this kind of push-button functionality, and you should expect other competitors to introduce the feature as well.